Here’s an absolute gem from the Etsy blog! 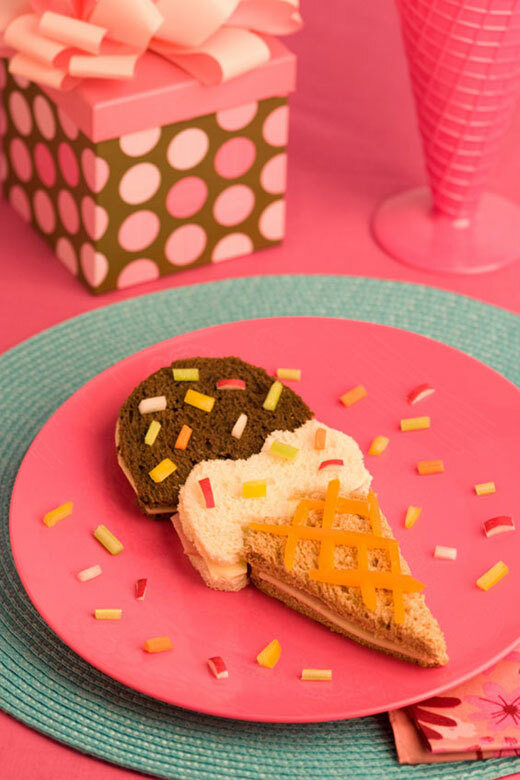 An ice cream sandwich – the kind made with bread. Get it? Eek! So cute! Remove crusts from all bread and then cut each slice of bread in half. Fold like pieces of bread together. Cut a large triangular shape for the cone from the whole wheat bread. Cut an ice cream “dip” from white bread, as shown with a drippy bottom. You will need to cut the top of the “cone” to the shape of your white dip, just cutting away a tiny amount so the fit is good. Cut a second dip from the pumpernickel in the same manner. Adjust the top of the white dip to fit the bottom of the dark dip, as shown. All pieces should align nicely. Fill all sandwich pieces with desired filling and set in place on the plate. Cut thin strips of carrot to form the cross hatching on the cone. Cut pieces to fit. Now cut little snippets of different colored veggies to make “sprinkles” to add to the top of the ice cream. We used radish, celery, yellow pepper and orange pepper. Use whatever veggies you have on hand. Finish by garnishing the plate with extra little sprinkles. This project was dreamed up and photographed by Kristin Fitch of Ziggity Zoom and featured on the Etsy Storque.